You’ve probably heard of the importance of hydration and electrolytes. An electrolyte imbalance can lead to a variety of uncomfortable and even dangerous symptoms, such as dizziness, muscles spasms, fatigue, and anxiety. In this article, I want to share with you what electrolytes are, common causes and symptoms of an electrolyte imbalance, and how to correct an electrolyte imbalance naturally. Electrolytes are nutrients that are important for a variety of essential functions in your body including brain, nerve, and muscle function. Keeping your electrolyte levels balanced is absolutely necessary for your health and well-being. The good news is that you can do that through a variety of simple and natural strategies. Fluids in your body contain electrolytes gained from the food and liquids you consume. Electrolytes are chemicals or nutrients in your body that have many essential responsibilities for your healthy functioning and overall well-being, including brain, nerve, and muscle function, and the creation of new tissue (1, 2). 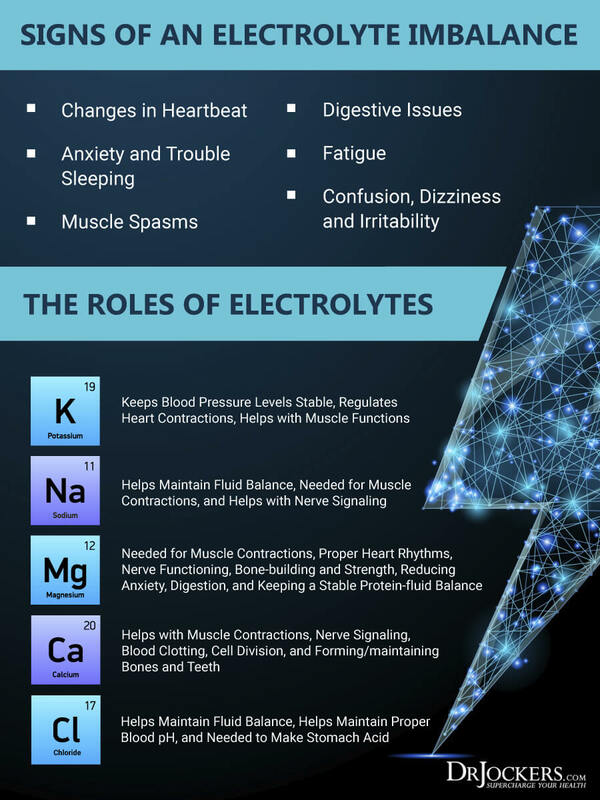 When electrolytes dissolve in your body fluid, it allows them to conduct electricity and sends electrical signals throughout your body to support bodily functions to keep you alive and healthy. Among various functions, electrolytes help to regulate your heartbeat and allow muscle contraction and movement (3). Because electrolytes are necessary for healthy functioning, keeping your electrolytes at a healthy level is essential. Electrolyte imbalance can result in negative, and sometimes serious symptoms. You may lose electrolytes through sweating, exercise, going to the bathroom, or due to a poor diet. You can replenish them through a variety of foods and fluids and by ensuring a nutrient-dense diet and essential hydration. (4). Electrolytes include salt, potassium, calcium, chloride, and other minerals. Each plays a specific role in your body. Let’s take a look at them one by one (5). Calcium helps your body with muscle contractions, muscle movement, cell division, nerve signaling, blood clotting and by forming and maintaining bones and teeth. Potassium helps with stable blood pressure, muscle functions, bone health, nerve impulses, balance, and regulating heart contractions. Magnesium helps with muscle contractions, nerve functioning, bone building, bone strength, healthy digestion, regulating your heart rhythms, maintaining healthy blood glucose levels, ensuring a strong immune system, reducing anxiety, and sustaining a stable protein-fluid balance. Sodium helps to maintain fluid balance, nerve signaling, blood pressure, and muscle contractions. Chloride helps to maintain fluid balance and a healthy pH balance, and to bolster healthy digestion. Phosphate helps to strengthen your bones and teeth, and with the production of energy for tissue growth and repair. Bicarbonate helps with regulating your heart function and maintaining a healthy pH balance. While it’s normal for your electrolyte levels to fluctuate, they may become imbalanced for a variety of reasons. This imbalance may be the result of your body creating too few or too many electrolytes (1, 6, 7, 8, 9). If you are on a ketogenic diet it is important to pay attention to your electrolyte levels even if you are drinking a lot of water. On a diet, you may lose a lot of water weight. As a result of the increased water excretion and decreased water retention, your body may also flush essential electrolytes. 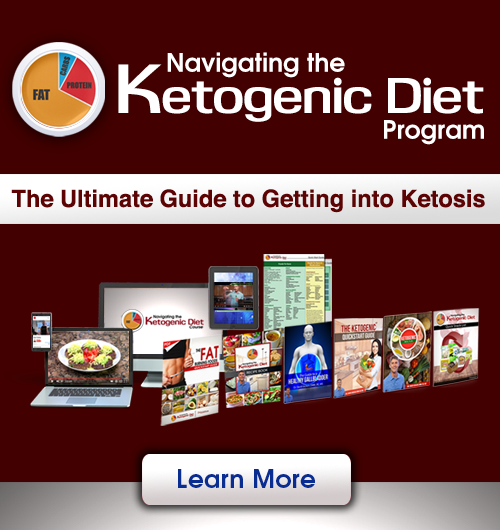 If you are doing keto, drink plenty of fluids while paying attention to and ensuring that you are replenishing sodium, potassium, magnesium, and electrolytes. Later in this article, I will share some proven tips to replenish your electrolytes, including using an Advanced Electrolyte Formula. Electrolytes play a variety of important roles within your body. As a result, an electrolyte imbalance can result in noticeable changes very quickly in your body. Your symptoms may vary depending on the type of electrolyte imbalance you are experiencing and the electrolytes you may be low on. It would be wise to address your electrolyte levels if you are experiencing these symptoms. One of the signs of an electrolyte imbalance is dizziness. If your sodium levels rise to quickly and drastically, it’s called hypernatremia. This condition is characterized by dizziness and weakness. In more serious cases it may also lead to delirium and seizures or coma. If your magnesium or potassium levels drop you may feel tired. Low potassium levels may affect how your body stores glycogen, which is the energy source for your muscles. As a result, it can lead to muscle weakness and overall fatigue. Electrolyte imbalances may lead to a fast heartbeat and mental disturbances. Low levels of magnesium may particularly interfere with the feeling of calm and balance and may lead to anxiety instead (13). If you are dehydrated, your potassium, magnesium, calcium and other electrolyte levels drop quickly. This abrupt fall can lead to muscle spasms, weakness, cramps, and pain. If your magnesium or potassium levels drop you may feel tired, yet you may also have trouble sleeping and obtaining a good rest. Electrolyte imbalances may also lead to anxiety, fast heartbeat, night sweats, pains, and muscle spasms, which all interfere with your sleep and overall energy levels. Hypernatremia, or a rapid sodium rise, can lead to dizziness and weakness and may also lead to irritability. In general, electrolyte imbalances may affect your mental wellbeing and may lead to irritability or moodiness (13). A rise in potassium levels results in hyperkalemia, which interferes with normal signals between nerves and muscles and results in rapid heart rhythms and palpitations, as well as tingling and numbness. High calcium levels may also result in heartbeat changes (14, 15). Electrolyte imbalances can affect your mental health and brain power by leading to mental confusion, concentration difficulties, and mood changes. High calcium levels may lead to mental confusion, emotional swings, and delirium (13). Magnesium imbalance is associated with changes in blood pressure. High magnesium (hypermagnesemia) may cause low blood pressure, on the other hand, low magnesium, or hypomagnesemia may lead to high blood pressure. Regular headaches and migraines may be a sign of an electrolyte imbalance, as well as dehydration. Migraines are often associated with low magnesium levels. Electrolyte imbalances are often the result of dehydration. Your body sends signals of this imbalance through thirst and dry mouth. If you have an electrolyte imbalance, the muscles within your digestive tract may not be able to contract properly. This can lead to diarrhea, constipation, cramping, and other stomach problems. Low sodium levels may also lead to nausea and vomiting. If you are experiencing any of these symptoms, it is important to call your doctor, get tested for electrolyte imbalances, receive treatment, and correct any underlying issues. Severe electrolyte imbalance can be life-threatening (16). If your doctor suspects that an electrolyte imbalance is behind your symptoms, they will do a blood test. You may also be able to get tested through independent laboratories. If you are experiencing any symptoms of an electrolyte imbalance or feeling concerned otherwise, make certain to visit a doctor. To diagnose an electrolyte imbalance, your doctor will go through your symptom history, perform a physical examination and take a blood and/or urine test. If they find any abnormalities, they may suggest further testing. Because potassium, magnesium and sodium levels can affect your heart rhythm, further testing may include an electrocardiogram (EKG). They may also order an ultrasound or x-ray of your kidneys to make sure your electrolyte imbalance is not the result of kidney problems. Once the appropriate diagnosis is made, your doctor can help you with the right treatment plan (17). Nutrition and hydration: Correct nutrition and hydration may correct electrolyte imbalances. It is also essential to avoid electrolyte imbalances altogether. I will touch on this in the next section in detail. Supplements: Supplementation can help replace depleted electrolytes and correct imbalances. Supplements can be utilized on a short and a long-term basis. IV fluids: IV fluid can help to rehydrate your body typically through sodium chloride. They are often used when you are dehydrated from diarrhea or vomiting. Electrolyte supplements may be added to your IV to correct deficiencies in the short-term. Certain IV medications: IV medications may be used to balance your electrolyte levels quickly and to offer a short-term solution. Oral medications: Your doctor may prescribe oral medications to correct chronic mineral abnormalities, especially if you have an ongoing kidney disease. Hemodialysis: Hemodialysis uses a machine to remove waste from your blood if your electrolyte imbalance is the result of kidney damage and if other treatments aren’t working. The good news is that when it comes to electrolyte imbalances, in most cases it’s easy to prevent the imbalance naturally. Let me share with you my favorite tips to avoid an electrolyte imbalance through simple and natural strategies. Many people develop an electrolyte imbalance when the amount of water in their body changes. This may be from dehydration after not drinking enough water or from overhydration from drinking too much water. Optimal hydration, or drinking enough water but not too much is essential to keep your electrolytes at a balanced level without over-diluting your cells (18 19). How much water you need, depends on many factors, including the weather, your exercise level, diet, body weight, and overall health. While 8 to 10 glasses of water is the general recommendation, it is not always the case for everyone. A useful tip to follow is drinking enough so you have to urinate at least every three to four hours. If you are participating in vigorous exercise, spend time outside in hot weather, sweat a lot, have a fever, or are sick with diarrhea or vomiting, you need to increase your water intake. 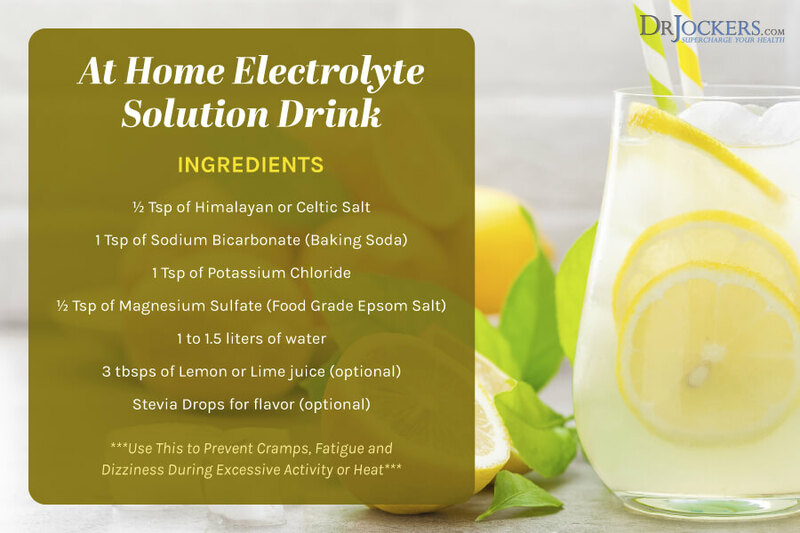 In these cases, it is particularly important to drink electrolyte-rich beverages such as Electro Balance™ to avoid dehydration and a drastic drop in electrolytes. Women who are pregnant or breastfeeding also need more fluid per day, as do growing children and teens. While most people struggle to get enough fluids in a day, over-hydration can be a problem as well. If your kidneys are unable to release the excess amounts of water, your electrolytes become diluted resulting in low electrolyte levels, low sodium in particular. 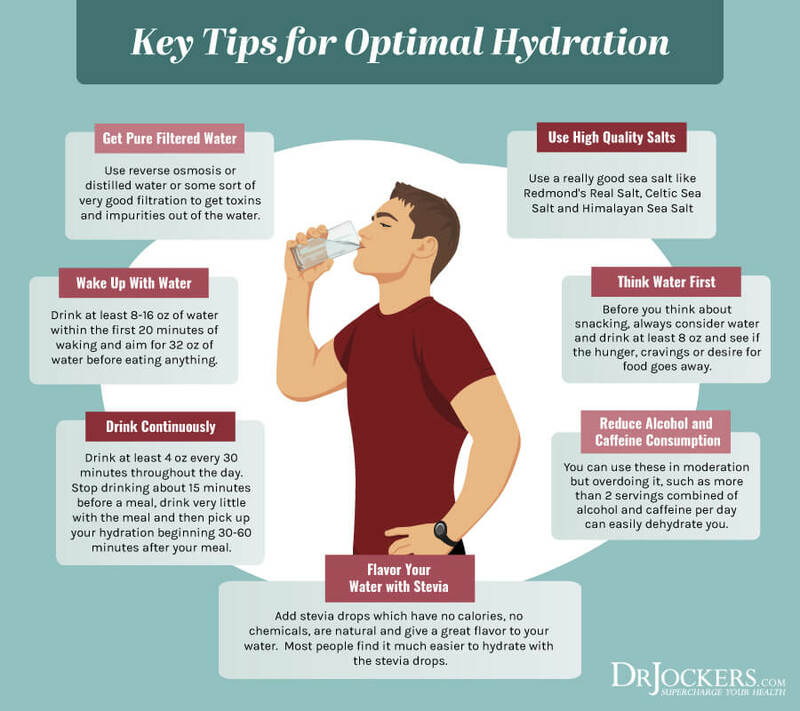 Overhydration is more common among endurance athletes, so if you are exercising, makes sure to hydrate at an optimal level (20). To avoid the risk of and correct an electrolyte imbalance, it is important to identify the root cause of the problem. In many cases, the culprit is a poor diet that is high in processed foods and low in nutrient-dense whole foods. You would be surprised to know, in how many cases simple diet changes can correct minor electrolyte imbalances. 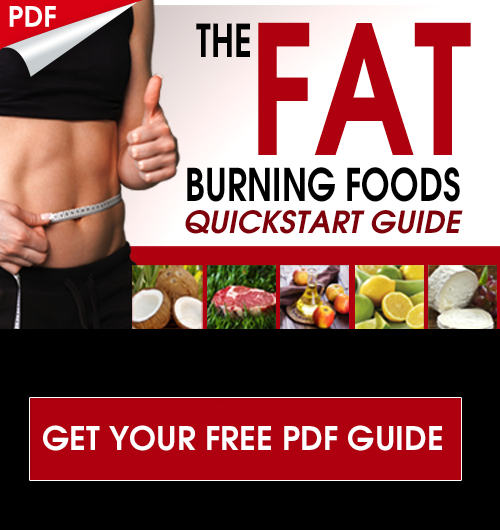 Cut back on processed food, junk food, takeout, and eating out. Choose to prepare your own meals using nutrient-dense foods rich in trace minerals. Furthermore, eating a diet high in processed foods and low in whole foods may lead to dehydration. Most processed foods are low in water and may even prove to be dehydrating. On the other hand, greens, vegetables, fruits, and other whole plant foods can be incredibly hydrating. I especially like celery, cucumbers and dark green leafy veggies for adding back good hydration and minerals with very low levels of sugar and carbs. 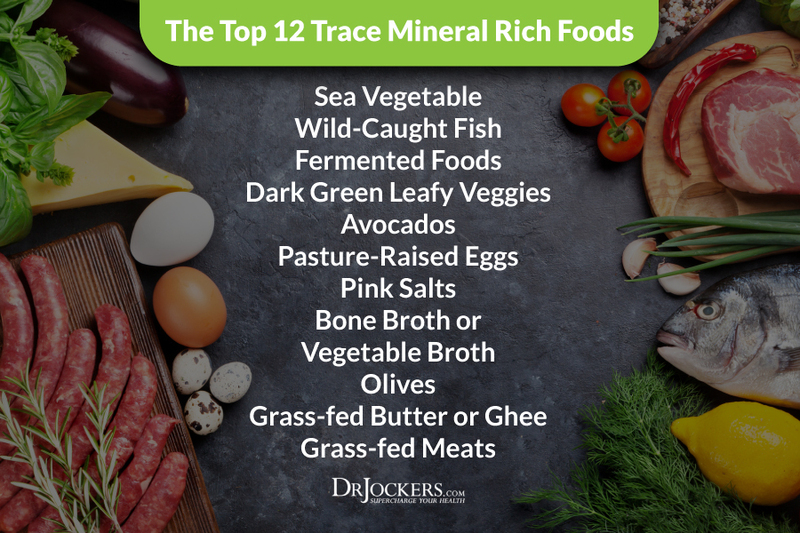 In general, this image below summarizes my top 12 trace mineral rich foods to focus on as the core of your nutrition plan. Your body needs salts for healthy functioning. However, traditional table salts are chemically synthesized and isolated forms of sodium chloride (NaCI). They are far from natural and are not the best choices for optimal nutrition. Natural salts can actually help regulate fluid balance in the tissues of your body and help to prevent electrolyte imbalance. I recommend Himalayan, Celtic and Redmond’s sea salt. These natural salts contain over 80 different minerals in trace amounts, including zinc, manganese, phosphorus, and silica. If you are craving salty foods, there is a high chance that your body is actually craving trace minerals. These three natural salts are excellent options to add to your food to satisfy cravings and correct imbalances. You may be surprised to learn that stress can deplete your electrolyte levels. Research has found that mental and emotional stress can result in increased sodium and potassium loss. 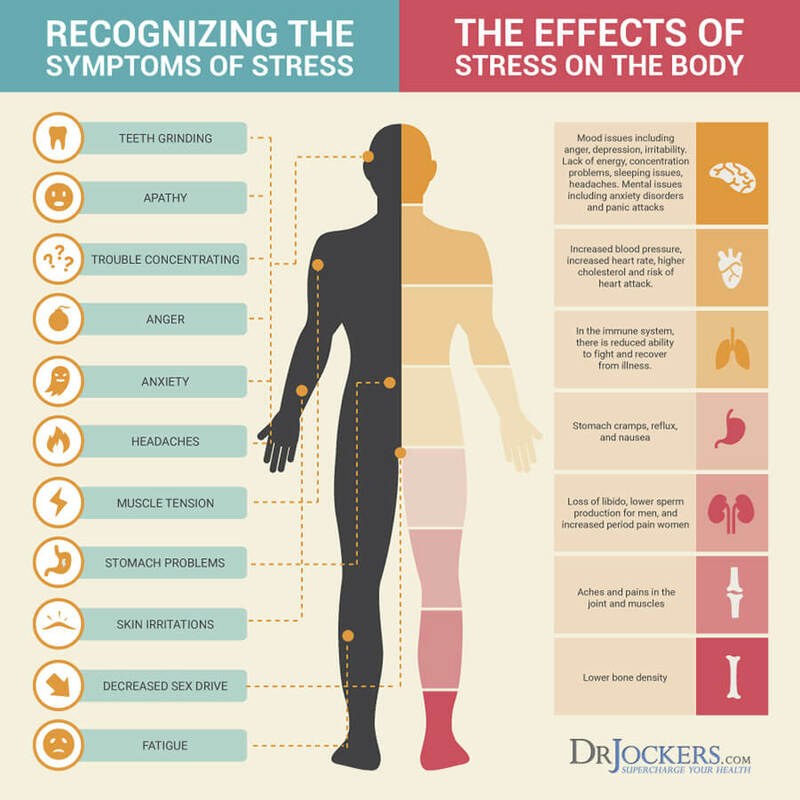 Generally, stress can interfere with your sodium and water balance. When you are stressed, you may sweat more and you may also pay less attention to your diet and fluid intake which may result in an electrolyte imbalance. Furthermore, an electrolyte imbalance can lead to anxiety, irritability, mood changes, and fatigue which may feed into the cycle of ongoing stress and an electrolyte imbalance (22). To avoid an electrolyte imbalance, it is crucial to pay attention to your stress levels and reduce stress as much as possible. Meditation, yoga, breathing exercises, relaxation techniques, journaling, prayer, exercise, coloring, uplifting activities, laughter, cooking, time spent in nature, or with loved ones, and playing with pets are all fantastic ways to reduce your stress levels naturally. Learning how to respond to stressful situations in a better way is also important. Meditation, breathing exercises, positive mindset shifts, an attitude of gratitude, cognitive-behavioral techniques, and therapy can help you improve your responses to stress. Certain medications, including antibiotics, diuretics, corticosteroids, hormonal pills, blood pressure medications, and cancer treatments may interfere with your electrolyte levels. Electrolyte imbalances are often seen in cancer patients receiving chemotherapy and may result in high blood calcium levels or other imbalances. Diuretics or laxatives may result in changes in potassium, sodium, calcium and magnesium levels resulting in digestive issues, fast heartbeats, anxiety, and trouble sleeping (17, 23). If you are taking any of these medications, started a new medication or supplement, or changed your dose and notice signs of an electrolyte imbalance, such as changes in your heartbeat, sleep, mood, and energy levels, talk to your doctor to adjust your medication dose or find the appropriate solution to balance your electrolyte levels. If you are exercising, engaging in excessive activity or sweating otherwise, then you are running a risk of changes in your electrolyte levels. Hence, paying attention to your fluids and diet is particularly important. Dehydration can lead to muscle cramps and pain, fatigue, dizziness, and confusion (24, 25). Make sure to hydrate well while exercising or when physically active. Drink enough water before, during, and after your activity. Make sure to add 1.5 to 2.5 cups of extra water for shorter workouts and 3 or more extra cups when working out for a longer period. While sports drinks are a popular way to replenish electrolytes during physical activity, I recommend Electro Balance™ as a powerful, natural, sugar-free, and well-absorbing solution. Coconut water is another excellent choice as a natural sports drink which is naturally high in electrolytes (20, 26). It is also important to replenish your electrolytes and fuel your body after a workout through nutrient-dense foods. Making a smoothie or protein shake using some electrolyte-rich foods is a fantastic, easily digestible, and nutrient-dense idea to help with electrolyte balance, hydration, muscle recovery, energy, and your overall health. Use the list of foods I shared above to recover from your workouts faster. Sweat Leaf Stevia Water Drops to flavor. I like these ones here which make it taste good. Mix your ingredients with 1 to 1.5 liters of water. Use it as needed. To prevent electrolyte imbalance, drink a small glass daily. Electro Balance™ is complete and balanced electrolyte formula I use regularly and recommend my patients frequently. I specifically designed this formula to help promote optional hydration, especially after excessive sweating. Electro Balance™ contains the main electrolytes found in your body and which you need in order to function well: potassium sodium, chloride, and magnesium. I also added D-ribose because it is important for healthy cardiac function, exercise, recovery, and energy production, and taurine to regulate cellular electrolyte flow. It also contains vitamin C, along with the synergistic compounds quercetin and citrus bioflavonoids to support your cardiovascular system by helping to build healthy collagen, which is one of the main structural components of your blood vessels. Electro Balance™ has a delicious natural lemon-orange flavor. It is sugar-free and gets its natural sweetness from stevia. Mix 8 grams, or about 2 teaspoons with 10 – 12 ounces of water or any sports beverage. You can freeze it to make popsicles or flavorful ice cubes. Drink one glass daily or more if needed. Electrolytes are nutrients that are important for a variety of essential functions in your body including brain, nerve, and muscle function. An electrolyte imbalance can lead to a variety of uncomfortable and even dangerous symptoms, such as dizziness, muscles spasms, fatigue, and anxiety. Keeping your electrolyte levels balanced is absolutely necessary for your health and well-being. You can achieve balanced electrolyte levels through a variety of simple and natural strategies such as optimal hydration, consuming foods rich in trace minerals, reducing stress, checking with your doctor regarding your medications, being careful with excessive activity or sweating and drinking electrolyte drinks such as homemade drinks or an advanced electrolyte formula, Electro Balance™. This product is a complete and balanced electrolyte formula which I highly recommend to help promote optimal hydration, especially after excessive sweating. It contains potassium sodium, chloride, and magnesium to support electrolyte balance. It also contains D-ribose for ensuring healthy cardiac function, recovery, and energy production as well as taurine to regulate cellular electrolyte flow and vitamin C, quercetin and citrus bioflavonoids to build healthy collagen. Drink Electro Balance™ to avoid an electrolyte imbalance and increase your energy and overall health. 1. Electrolyte imbalance. Comprehensive Cancer Center. 3. Fluid and electrolyte imbalance. MedlinePlus. 10. Addiss, F. Electrolytes – What are they? What happens if you don’t have enough. Roswell Park.